There are plenty of Manhattan to JFK Airport transfer options, I always recommend to plan ahead. Knowing you have your return journey back to the airport figured out, will allow you to enjoy your last day in New York stress-free. You can travel by taxi, bus, shuttle bus, subway or train to JFK Airport. Alternatively, if you need to travel from New Jersey, Brooklyn or Queens, click here. You can easily take a yellow cab from Manhattan to JFK Airport. It will cost approximately $55 to $60, plus toll and $7 to $10 tip. Know that hailing a cab isn’t always easy during rush hour. In New York you can’t call for a cab, you have to hail one on the street. If you have to travel between 7:30 – 9:30 or 16:00 – 19:00 I would recommend you use one of the other options below. These shared shuttle buses will pick you up at your hotel or apartment and bring you to JFK Airport. Please note that most buses don’t pick up beyond 125th Street in Manhattan. The ticket costs $20 to JFK Airport. These buses are very easy to take and I recommend them to everyone because they will pick you up and you don’t have the stress of not being able to find a taxi. They do take a bit longer than a taxi, as they have to pick up several people before heading to the airport. After booking, read your voucher closely for instructions on how to be picked up at the location and time of your choice. Choose the value private transfer and have everything organised before your departure to New York. After booking the transfer you will receive a voucher with a link to reference your flight details and preferred pick up time. This transfer does not include tolls and tip. Book an airport transfer by limousine and depart for New York City in style. You can take a limo transfer from your hotel to the airport for a maximum of 8 people. NYC Express Bus provides shuttle buses between Manhattan and JFK Airport. These buses run from Grand Central and Port Authority in Manhattan, approximately every hour between 11:00 and 19:00. Children under 5 travel for free! Most buses have free internet too. Buses can be busy, so travel with enough time to spare. You can take either the A or E subway to the AirTrain. The subway itself costs $2.75 (plus $1 for a new MetroCard) and you must pay an additional $5 for the AirTrain. This trip takes about 1.5 hours and if you are traveling with a lot of luggage before a long flight, then it is not recommended. You can take the Long Island Rail Road train at Penn Station in Manhattan to Jamaica station. 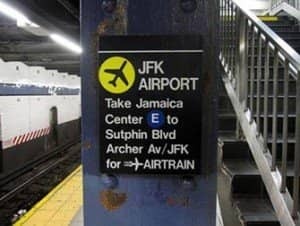 From there you will need to take the AirTrain to JFK Airport. The train costs between $7.25 and $10 and the AirTrain costs $5. Eric’s Tip: I personally book the shuttle bus or a town car. Shuttle buses cost $20 and pick you up at your hotel or apartment. Limousines or town cars also pick you up. For a calm and more relaxed trip back to the airport, this is a better way to go than to struggle finding a taxi, especially between 15:30 and 19:00 when it is the hardest time to hail a cab. Pre booking your shuttle bus or limousine is necessary, and can be done here.